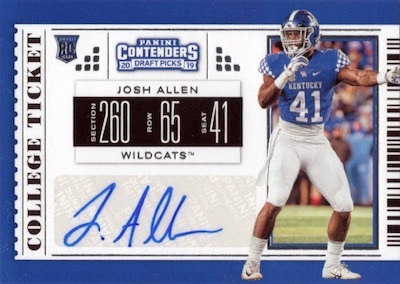 Another early-season option from the Panini Collegiate outfit, 2019 Panini Contenders Draft Picks Football offers six autographs per Hobby box. 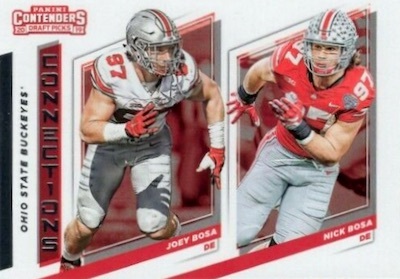 The big draw for many is the hard-signed College Ticket autograph set for some of the top players heading into the 2019 NFL Draft. Of course, like 2018, the real mystery comes with the many expected short prints. 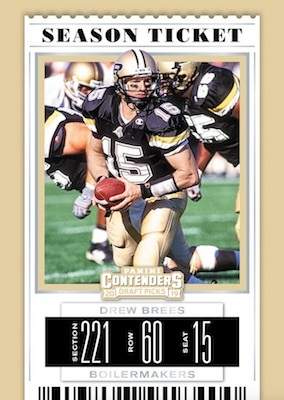 Instead of a standard base set, 2019 Panini Contenders Draft Picks Football opts for the Contenders tradition of Season Ticket cards. These show current NFL players during their college careers. In addition to parallels like Cracked Ice and Printing Plates, there are also Draft Ticket versions. Parallels and inserts combine to average five per box. 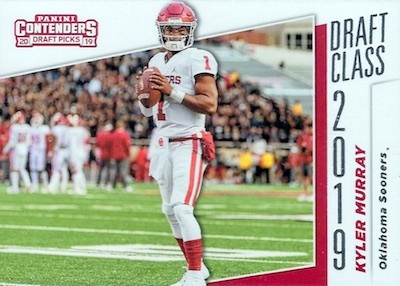 The clear standout of the 2019 Panini Contenders Draft Picks Football checklist is the College Ticket autograph subset. With over 150 cards in play, including some hard-signed options for key names, these are sure to see big interest from collectors. Parallels include Hobby-only Bowl Ticket (#/99), Cracked Ice Ticket (#/23), Playoff Ticket (#/15), Championship Ticket (1/1), and Printing Plate (1/1) editions. Among the other autographs in 2019 Panini Contenders Draft Picks Football, the 25-card Game Day Ticket Signatures features the likely NFL rookies from the top college programs, and the 20-card School Colors Signatures works in even more of the possible first-year NFL talent. In addition, Collegiate Connections Signatures is a dual-autograph set that pairs either two notable prospects or a recent star and former great from the same school. Paying tribute to all-time college legends, the Season Ticket Signatures design mirrors the College Ticket style. 2018 PANINI PLAYOFF CONTENDERS DRAFT CLASS RPS CALVIN RIDLEY AUTO RC FALCONS #? TICKET PARALLELS: Draft Blue Foil, Draft Red Foil, Bowl #/99, Cracked Ice #/23, Diamond #/15, Building Blocks #/10, Fame #/5, Championship 1/1, Printing Plates 1/1. 25 cards. Shop autographs on eBay. TICKET PARALLELS: Draft Blue Foil (No Jacobs*), Draft Red Foil, Bowl #/25, Cracked Ice #/23, Playoff #/18, Diamond #/15, Building Blocks #/10, Fame #/5, Championship 1/1, Printing Plates 1/1. 25 subjects and 73 cards. Every player has an A/B/C version with parallels for each, except as noted below. TICKET PARALLELS: Draft Blue Foil, Draft Red Foil, Bowl #/25, Cracked Ice #/23, Playoff #/18, Diamond #/15, Building Blocks #/10, Fame #/5, Championship 1/1, Printing Plates. 173 cards. Shop autographs on eBay. PARALLEL CARDS: Draft Blue Foil, Draft Red Foil. VERSIONS: Bowl #/99, Cracked Ice #/23, Playoff #/18, Diamond #/15, Building Blocks #/10, Fame #/5, Championship 1/1, Printing Plates 1/1. TICKET PARALLELS: Blue Foil, Red Foil, Bowl #/99, Cracked Ice #/23, Playoff #/18, Diamond #/15, Building Blocks #/10, Fame #/5, Championship 1/1, Printing Plates 1/1. 25 cards. 1 per FOTL box. PARALLEL CARDS: Black, Gold, Green, Hyper, Mojo. Buy 2019 Contenders Draft autographs on eBay. PARALLEL CARDS: Cracked Ice #/23, Diamond #/15 or 1/1*, Building Blocks #/10 or 1/1*, Fame #/5 or 1/1*, Championship 1/1. PARALLEL CARDS: Bowl #/25 (Henderson #/5*), Cracked Ice #/23, Playoff #/18, Diamond #/15, Building Blocks #/10, Blue Foil #/5, Fame #/5, Championship 1/1, Red Foil 1/1, Printing Plates 1/1. PARALLEL CARDS: Cracked Ice #/23, Diamond #/15, Building Blocks #/10, Fame #/5, Championship 1/1. PARALLEL CARDS: Bowl #/99 or less, Cracked Ice #/23, Playoff #/18 or 1/1 (No Walker*), Diamond #/15 or 1/1, Building Blocks #/10 or 1/1, Fame #/5 or 1/1, Championship 1/1, Printing Plates 1/1. PARALLEL CARDS: Red Foil 1/1. View the 2019 Panini Contenders Draft Picks Football checklist Excel spreadsheet. 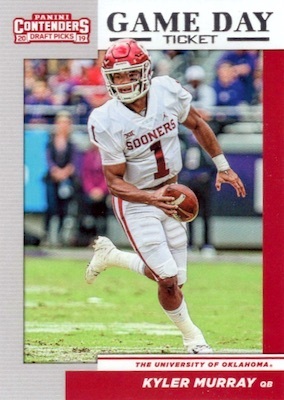 Will it have Kyler Murray autos? Nothing is certain until the checklist is revealed. Never understood the appeal of this brand. They always look the same. The First Off the Line boxes I see have some of the most mediocre hits I’ve ever seen in a First Off the Line. Hopefully hobby boxes will have better hits, but I prefer prime and intend to skip this product altogether.